Most of the army came in ready-made units, most of them mercenaries, led by the men who had recruited them. It was not the mere size of the army that made Tissaphernes suspicious, but the composition of it. He took a troop of 500 cavalry and fled to inform the king about Cyrus’s expanding army. This is the army that Xenophon had decided to join. He did not come as a soldier, commander or mercenary. He was there because of the request of his friend Proxenus. It was said that there was an army and then there was Xenophon. He was motivated by the sense of adventure that the journey would provide (Waterfield, 2006). Xenophon arrived just as the army was about to set out and just in time to be introduced to Cyrus. By now the size of the army and the diversity of the troops were beginning to cause chaos on the outskirts of the city were they were camped. They had already formed themselves into units. Xenias was to command 4000 hoplites, Sophaenetus another 1000 and Socrates another 500; Proxenus’ unit consisted of 1500 hoplites and 500 peltrasts, and Pasions 300 hoplites and 300 peltrasts (Waterfield, 2006). When the army began their march, it is said that they spread across the land for many kilometers. As they marched along through different towns, they continued to increase in numbers. By the time they were fully assembled the men were owed over three months’ pay. Cyrus kept them at bay with his promises of a wonderful future full of the rewards of the impending war (Xenophon, 2009). The men were beginning to think that Cyrus was not being forthright concerning his motives for the march. When accounting for the various nationalities separately, the Arcadians formed the largest contingent. Xenias, Sophaenetus and Agias are among the original generals in the beginning of the march. Xenias was one of the earliest to desert, and Agias was entrapped and killed at the Great Zab (Radin, 1911). It was Sophaenetus who was with the army the entire time. In spite of some deserters the men continued their march to the inevitable battle that was to come. 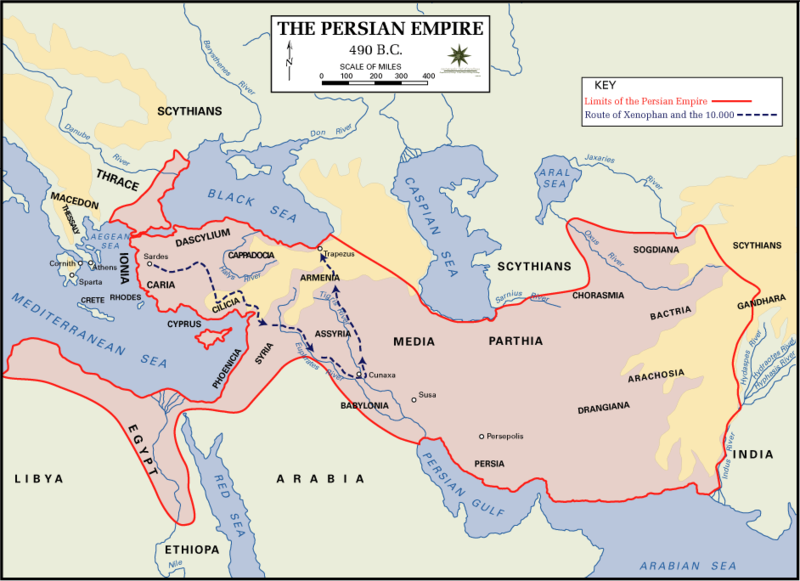 The image below illustrates the size and reach of the Persian Empire at the time of Xenophon’s march up country The black broken lines indicate the the route the army took on the march. (Cyrus the younger, 2012). Waterfield, R. (2006). Xenophone’s retreat, Greece, Persia and the end of the golden age. Cambridge: Havard University Press. Xenophon. (2009). The expedition of cyrus (2 ed.). (R. Waterfield, Trans.) New York: Oxford University Press.